SAHM looking to re-enter the workforce Diapers, bottles, soccer practice, mommy, mommy, mommy. Did you put your career on hold to raise your kids? Ready to re-enter the workforce? Has your situation changed and you have to work? “Mom” is one of the hardest jobs in the world! Transitioning from stay at home mom to working woman can be overwhelming and scary. Let Resume Butterfly help showcase all that you have to offer! Are you an experienced professional ready for the next challenge? Forced to change jobs because of the economy? Want to polish your resume so you are ready if an opportunity arises? Keep your resume out of the trash and get results! Want to get noticed for a position at the top? Showcase your accomplishments and wow factor. Now is the time to stand out and highlight all you have to offer! A cover letter is a must! It links your resume to the specific job you are applying for by highlighting relevant experience, providing additional details and communicating your specific interest. My style of cover letter WILL get noticed! Hiring managers don’t have time to read a novel. Available for existing resume clients. LinkedIn is the world’s largest business network. Don’t miss out on this opportunity to market yourself! Due to high demand we are only accepting a few new clients – we want to make sure we can provide you a quality resume in the timeline you need. Please fill out this form (or copy and paste this link into your browser – https://goo.gl/forms/4fMQryMSArwFTcdo1) and we will contact you via email within 48 hours of receiving your email to let you know if we are accepting you as a new client. Step 2. Payment – invest in your career! If you are accepted as a client we will email you an invoice through PayPal. Payment in full is due upon receipt. When we receive your payment, we will email you a resume makeover questionnaire, please fill it out and email it back along with a copy of your current resume (if you have one). Sit back and relax while your resume gets a makeover. On a short deadline? No problem, let us know! We will send you a copy to review. Let us know if you would like to request any changes. We will work together to finalize. Then we will send you a final PDF document and a Word document that you can continue to edit on your own. Remember that a resume is always changing- repeat clients are eligible for the “Repeat Client- Quick Tweak” package if you need a small update down the road. Ask for details. Have you joined our Career Corner yet? 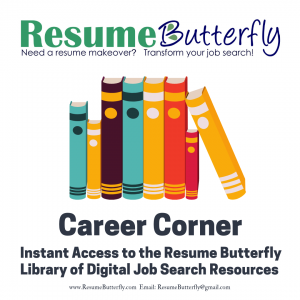 You’ll get INSTANT access to a jam-packed collection that captures 10+ years of my experience as a resume writer, Director of Career Services and manager. Most documents are easy to download as a PDF so you can read them anywhere – computer, tablet or smartphone! Everyone is welcome! I’d love for you to be a member even if we haven’t worked together on your resume. Valued at $297, I wanted to be sure these resources would be affordable to EVERYONE, so I am offering this at over 85% off for only $42 SALE – ONLY $19. Feel free to browse my blog and Facebook for job search tips! Due to high demand, we have decided to limit my number of new clients in order to give you the BEST. Quality and value are important to me. Howdy! I’m Jessica Smith, resume writer and small business owner. Welcome! Check out the Career Corner and our shop!